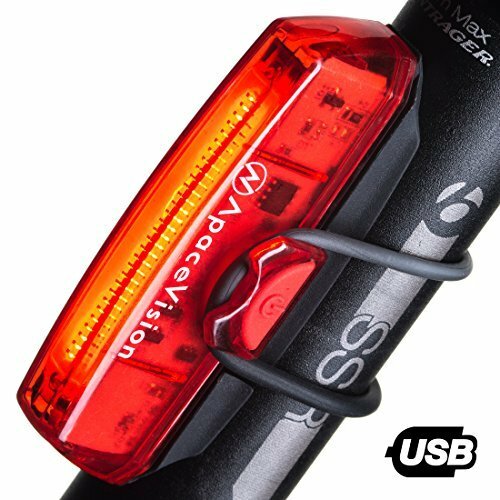 ⭐ We present the Apace Vision, the best rechargeable USB rear light, ultra bright, compact and weighing less than 30 gr. In this review we explain its features, advantages and we advance the best offers we have found in the market. ¿Why is the best rear bike light? Super bright. COB LED with 6 settings to give you the visibility you need on the busiest streets during the day and on the darkest roads at night. Superior battery life: 2 hours of charging gives you 12 hours of safety and fun! Lightweight and durable: The IPX3 waterproof rear light for bicycles weighs less than 30 g, but can with the harshest weather conditions. Visibility of 120 degrees and a wide beam of light: The wide beam of light allows you to be seen from a great distance and the visibility of 120 degrees will avoid blinding the driver or cyclist coming in the opposite direction and thus avoid any accident. Very well complemented with accessories, several sets of rubber bands of different sizes and two rubber supports. It allows several configurations of intensities and flicker modes, as well as the charging time is very short. You like what you see? Now you can buy the best rear bike light directly here! IMPRESIONANTE RELACIÓN CALIDAD-PRECIO - APTA PARA CUALQUIER BICICLETA: El kit de luces traseras para bicicleta prémium se engancha a prácticamente cualquier cuadro, horquilla, tija de sillín, manillar o casco de bicicleta. Te lo ponemos FÁCIL al incluir 1 luz LED trasera de bicicleta, 1 cable de carga USB, 2 monturas de silicona, 4 anillos de montaje de diferentes tamaños y un manual de usuario muy sencillo. ¡No necesitas herramientas! DISFRUTA CON GARANTÍA DOBLE: Ciclistas adultos y padres de niños ciclistas afirman que esta luz trasera perfecta para acompañar al faro delantero de bicicleta tiene una RELACIÓN CALIDAD-PRECIO IMPRESIONANTE. De CONSTRUCCIÓN SÓLIDA y con una garantía de 30 días para que quedes satisfecho o te devolvemos el dinero y 1 año de garantía completa, es la mejor luz trasera de seguridad disponible de su categoría.